It is now possible to freeze the current state of a firm, that becomes uneditable until it is unfrozen. Why should you want to freeze a firm? There can be different reasons. First off, you just want to prevent yourself to accidentally delete something from the firm. It could happen: you think you are working with a firm, but instead you are actually working on another. Since the edits of your firm's state are permanent, you may delete something you meant to stay. Freeze the firms that you want to be unmodifiable, and you are safe. Another case of use arises when you are a student that has to do a homework a teacher must check, and that there is a due date you must respect. How can the teacher be sure you respected the due date, and did not modify your firm afterwards? 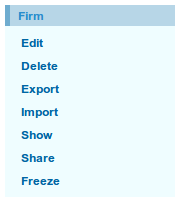 Quite simply, the teacher can ask you to freeze your firm before the due date, and he/she can check that you did that (a timestamp is applied to the firm when it gets frozen, and it is shown in its public page). Please note that timestamps are based on Central European Time. You can click on the date to see them in a different timezone.